UAAP Season 75 of Men's and Women's Volleyball game tournament is now set to start before year 2012 ends. The University Athletic Association of the Philippines (UAAP) volleyball game schedules and venues of the much awaited tournament that is to be held at the FilOil Flying V Arena, San Juan City will begin this coming December 1, 2012 up to January 13, 2013. The live telecast of this seasons UAAP Men's and Women's Volleyball Tournament will be aired live via Studio 23. As an opener game match are between National University (NU) against Adamson University (ADU) on December 1, at 2:00 p.m., then followed by Ateneo de Manila University (ADMU) versus Far Eastern University (FEU) on the 2nd game at 3:30 p.m.
For the meantime, please bookmark this page if you like to be updated in this UAAP Season 75 Men's and Women's Volleyball Game Tournaments. 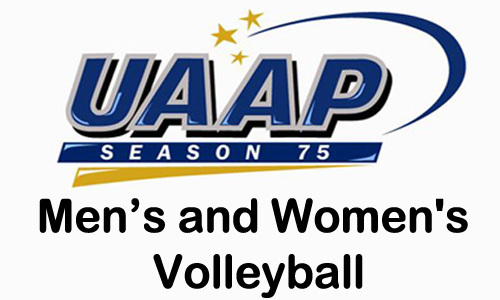 Comments or suggestions about "UAAP Season 75 Men's and Women's Volleyball Games Schedule, Venue and Results" is important to us, you may share it by using the comment box below.